Addison Stevens was just 2 years old when she underwent open-heart surgery—twice. Eight years later, her story is inspiring hundreds of high school students to give back in a big way. When Addison was born with a heart murmur, parents Scott and Jessica Stevens hoped she wouldn’t need major surgery. 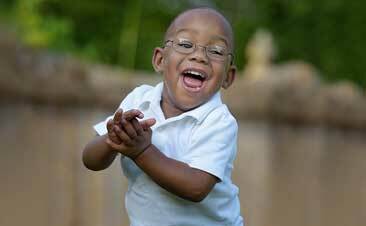 But a consultation at Riley Hospital for Children at Indiana University Health revealed a serious atrial septal defect—a hole in the wall that separates the two top chambers of the heart. In September 2007, Riley heart surgeon Mark Rodefeld, M.D., performed surgery to secure a patch over the hole. Although Addison’s recovery proved to be more complicated than most, her family appreciated the personalized care Dr. Rodefeld provided. “The compassion from him meant a lot to us,” says Scott. Today Addison is 10 years old and thriving. She plays volleyball, softball and basketball with no restrictions. She also loves to write and routinely wins contests for “coolest scar” among her fifth-grade classmates, her mom recounts with a laugh. “It’s just surreal to even talk about her surgery now. It seems like a lifetime ago,” Jessica says. The Stevens family loves to give back to Riley, an enthusiasm that spills over into Scott’s job as athletic director at Cascade High School in Hendricks County. Scott says students always turn out for Riley fundraisers. 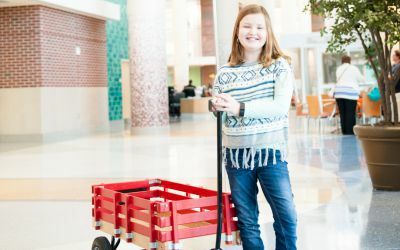 This year the school raised enough funds to be honored with a personalized license plate on Riley’s trademark red wagons, which are used to transport children around the hospital. 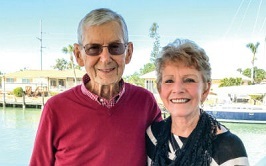 The Stevens were thrilled when the Mill Creek Community School Corporation was named a Riley Corporation through the Kids Caring & Sharing program, an honor for districts that raise at least a dollar for every student. These funds are used to support pediatric research at Riley Hospital so physician scientists can continue finding better ways to treat children with serious health conditions. Research at Riley includes laboratory work done by teams of investigators in the Wells Center for Pediatric Research, as well as research conducted by as physician scientists like Dr. Rodefeld, who also provide patient care.